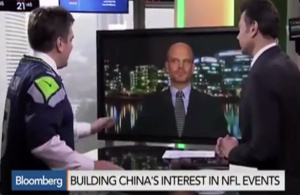 Fresh off a whirlwind media tour in the U.S., Marty Judge (Chairman and Founder of the CAFL) was back in Beijing to join with China’s governing body of U.S.-style football to join in the formal announcement of both his professional and college indoor leagues on Tuesday. “My dream is now a reality” Marty told the China national media at a news conference sponsored by the CRFA in the nation’s capital. The CRFA (China Rugby Football Association) is the governing body that will include U.S.-style indoor football among its approved athletic divisions. Judge was seated at the head table near the CRFA leader, Chairman Li, Secretary General Ms. Liu and other Chinese sports executives, to join in the groups announcement of an upcoming Sports Festival to be held in and around Beijing Olympic Park, site of the 2008 Summer Olympic Games. 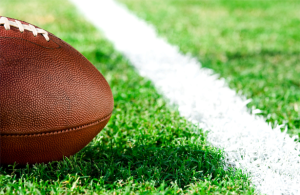 The CAFL’s college division will take part in the competition, as 6 University teams will participate in a week-long round robin tournament October 12-18. Student-athletes from 6 China “Sports Universities” have been training for indoor U.S.-style tackle football since the CAFL founded the programs, in cooperation with the CRFA, in May of 2013. The sports festival will be the first official live competition among the schools, and is thus historic for China. 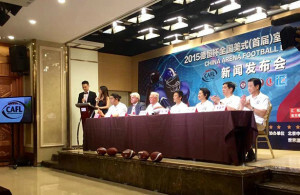 The CRFA used the occasion of the press conference to announce to the China media that Judge’s CAFL has now been officially approved to become the nation’s first ever professional U.S.-style football league, and will launch operations and play in the Fall of 2015 in 8 China cities. Lou Tilley Media will travel to China in the weeks ahead to cover and preview the teams, and will provide full coverage of the tournament on this web site.